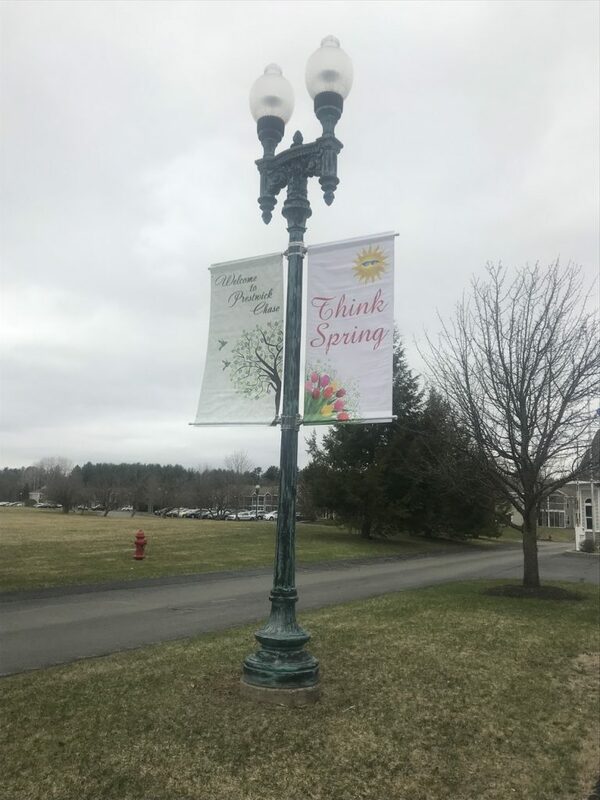 Prestwick Chase recently put up colorful Spring flag banners on their six light poles down the main blvd leading into the property. The bright colors are nice for the residents and their families to see. The warm colors remind us that Spring can not be far away. I am sure everyone can not wait for those 70 degree days when the trees bud and the flowers start to come out. Hopefully soon and before you know it ,…it will be time for garden boxes to be planted. 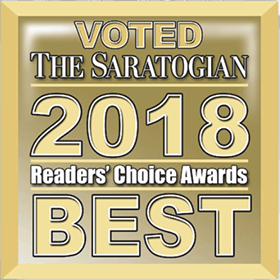 Prestwick Chase at Saratoga is proud to announce that we have been voted the Best Retirement Living Community by the readers of the Saratogian Newspaper for the 8th year in a row! 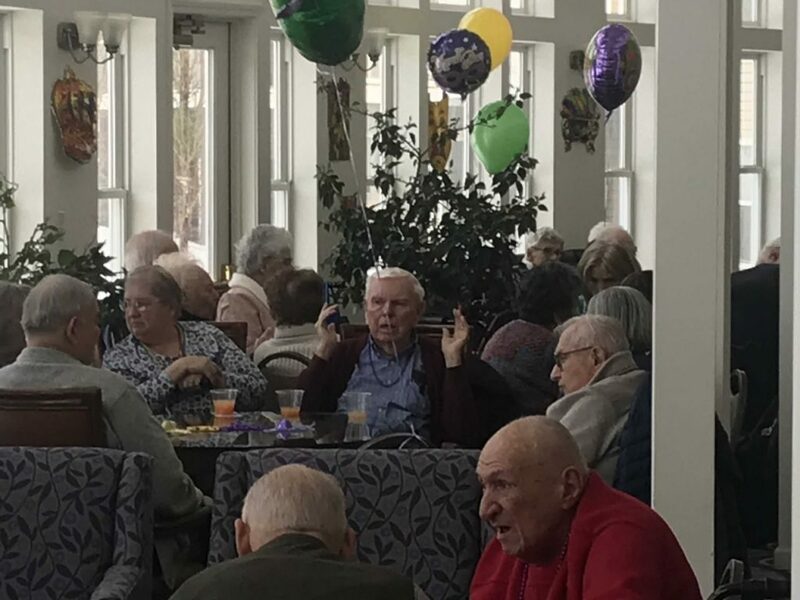 Residents at Prestwick Chase celebrated Mardi Gras. The Chefs prepared a fantastic menu. 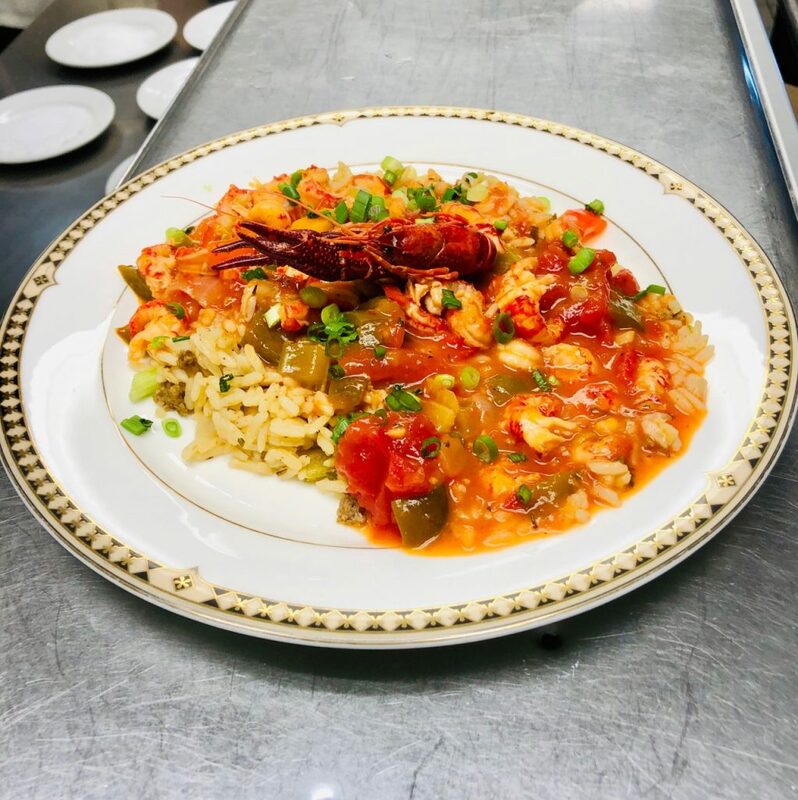 Some of the cuisines were Eggplant, Oyster and Tasso Gratin, Crawfish Etouffee, Shrimp Creole Risotto and Chicken and Ham Jambalaya. For desserts they had chocolate Lava Cake and Bourbon Banana Pudding with glazed Pecans. And if all that was not enough, the community was treated to complimentary Mardi Gras Hurricane drinks. There was live music from the Tolstrup Band and decorations through out. 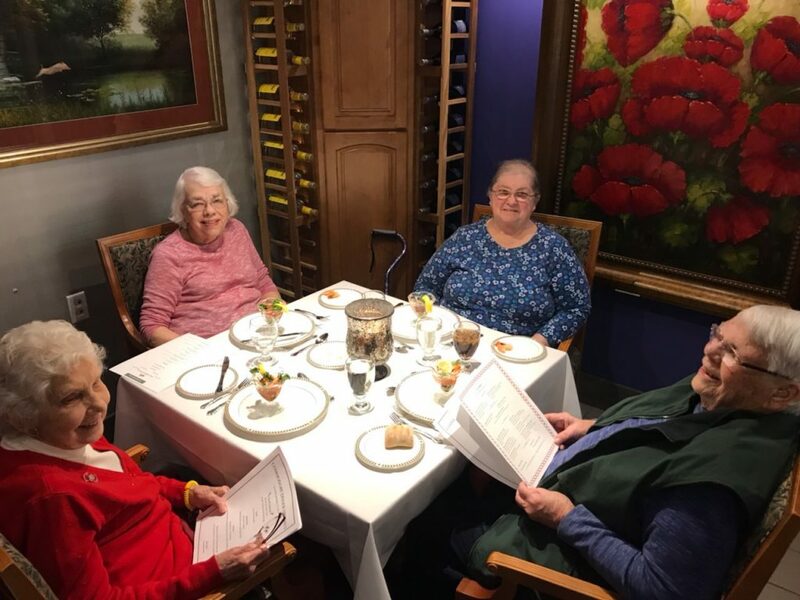 Our residents truly know how to have a good time and they did! Thank you to the Chef’s for coming up with such colorful festive cuisines for the residents to enjoy. 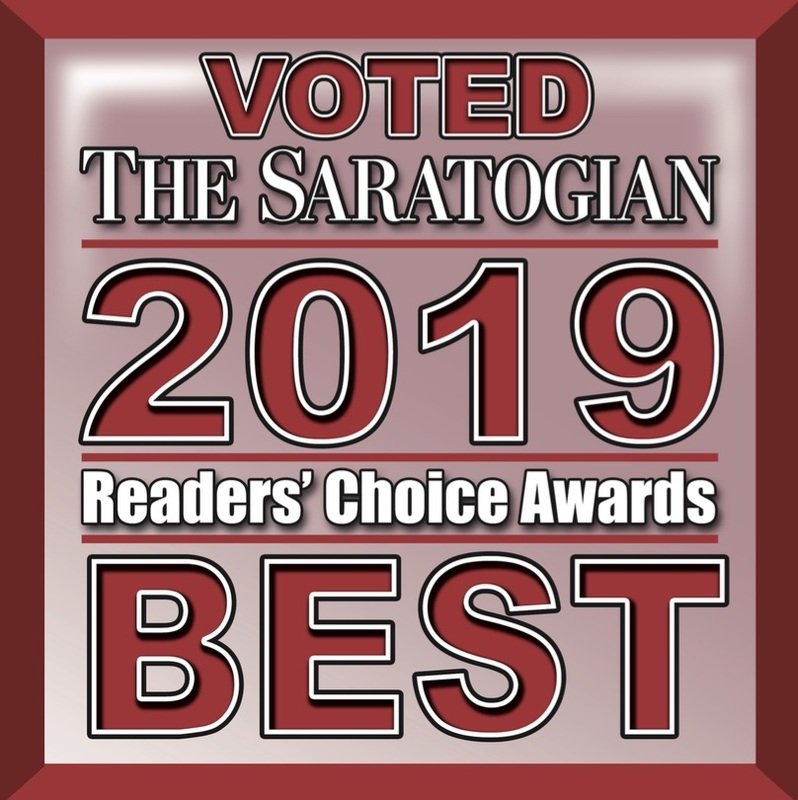 Just one more area that sets us apart from would be competition, we have our own 4 Star Kitchen preparing everything fresh to order. Thank you to Belinda the Activities Director and all the waitstaff who helped the days celebrations go so smoothly! 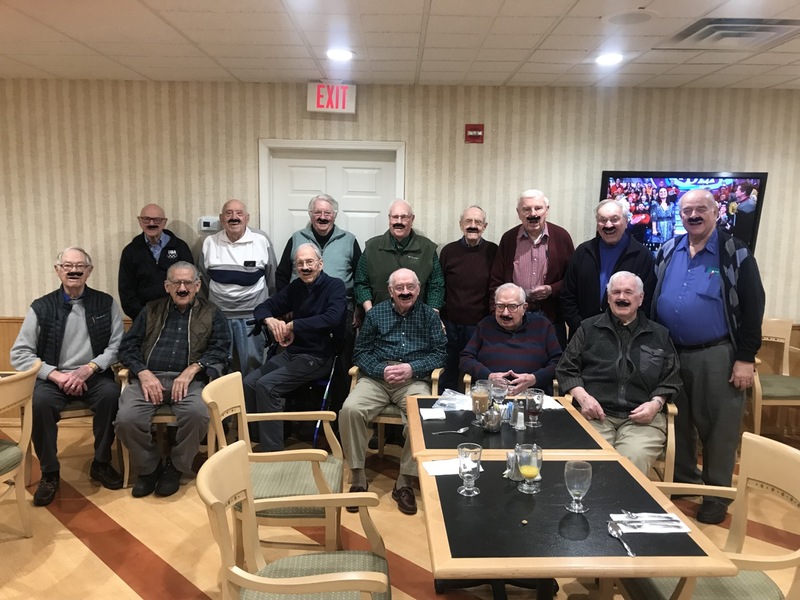 Each week the men and women of Prestwick Chase hold a weekly breakfast gathering. It is a time for new residents to meet new friends, engage in conversations on a wide variety of topics, or in the case below engage in some mustache shenanigans for their picture! The residents truly have a good time and are always up for a laugh. New residents were invited to enjoy a fine dining and good company in the Chef’s Office. This outing brings together 4 new residents who recently moved into the community. The concept is to let residents experience fine cuisine from the Chefs, while making new friends. We all know how it is to move into a new area and not really know anyone. This time together fosters the idea of community and allows new residents to socialize in a relaxed atmosphere. What better way to make new friends, then great food, great Chefs and a private dinner.